The current story arc concludes, as Simon and Jessica help the Ungaran regent cope with a multi-powered usurper who used to be her daughter. Like a pre-fabricated pop star who’s begun to believe her own press, Liseth has taken a xenophobic people and rallied them to her cause. Jessica seems up to the task, but Simon – well, he’s been emotionally compromised, and it’s going to be a greater challenge for him. Rather than a typical “ripped from the headlines” story, this one has the added seasoning of manufactured fame and its toxicity. In our own society, we sometimes listen to famous people who are famous for being famous, without considering their credibility. Rather than have such people weigh in on hot button issues, I’d rather they sing, dance, act or whatever it is they do best, and leave the governing to those who are qualified. Liseth has used technology to endow herself with the powers and abilities of thousands of individual races from throughout the galaxy. 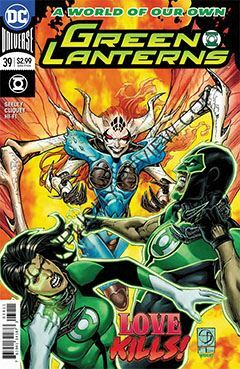 All those Legionnaires whose super-power is common on their homeworld now reside within Liseth, along with those of other extraterrestrials such as Martian Manhunter, Despero and Hawkman. It could be up to Jessica to defeat the Ariana Grande wannabe single-handed. It’s good to have Ronan Cliquet back at the drawing board. He’s always welcome in the pages of any Green Lantern title – or any other title, for that matter. His work is polished and professional, and has a refreshing individuality I don’t often see these days.